In less than a week from this writing, I will be doing a new webinar that I was asked to do by one of the STC Special Interest Groups (SIGs). I was really honored to have been asked, and it’s about a topic that I think I know a little something about–blogging. After all, this little webspot has been going strong for about 21 months now. But in putting this latest webinar together, I realized that while I felt that I could whip something decent together, it’s been a while since I had to craft a webinar presentation. This, in turn, reminded me that I had a promise to fulfull, as I sought out a reference in my personal library written by one of my tech comm knitting buddies. Pulling this reference out reminded me that I’ve been meaning to write this review since last spring, but had been side-tracked several times until now–when I really needed it most. 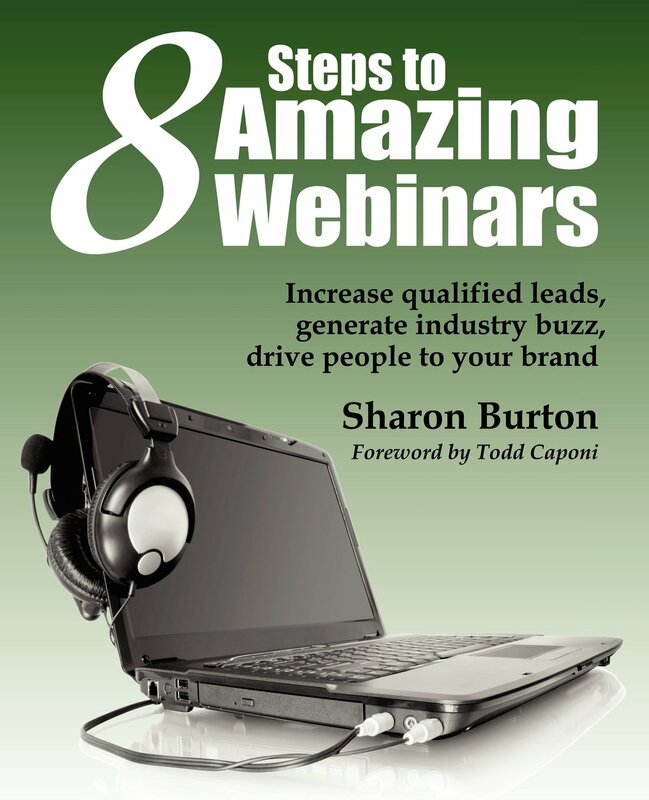 Sharon Burton’s book, 8 Steps to Amazing Webinars, is a slim volume of only 81 pages (and that’s the end of Appendix B), but it’s loaded with very concise information. 81 pages is all you need! Considering that this is a short and concise how-to book, it shouldn’t have taken me this long to write this! I truly try to read any books that I’m asked to review cover to cover, and this was a quick but highly informative read! There are several things I like about Sharon’s book. It’s short and to the point, as already mentioned. For busy presenters who have many things to do other than solely doing webinars, this is great resource because she gets straight to the heart of what needs to be done. Additionally, one of the things that I’ve found that Sharon and I have in common with our tech comm perspective is that our views are highly customer service-oriented. Before my life in an IT/tech comm world, I came from a customer service/client services background, so much of her advice on the how and why webinars can be great marketing tools geared towards customers made a lot of sense to me. Sharon’s eight steps take the reader from the point of understanding what a webinar is, through every step of the process of creating and following-up with the webinar, including choosing presenters, topics, technology needed, advertisting the webinar, and all the other preparation steps to creating the webinar. She even includes pointers on how to set up the presentation slides that are most likely going to be used in the presentation. As I read the book, I was quickly reminded of the first webinar that I did back in 2012 for Adobe’s Technical Communications group (you can find the link on the right-hand column of this blog). I remember not knowing the first thing about how to put together a webinar. At the time, Maxwell Hoffman, who is one of the evangelists for Adobe TCS, guided and coached me through the process, and it ended up being a great success. Looking back, I would not be surprised if Maxwell was already well-versed in the steps that Sharon outlines in her book, because I’m fairly sure that we followed every single step. When I also look back to the first in-person presentation I did, which lead to a recent webinar on the same topic, I realized that I had followed much of the same steps again, and got a great response as a result. These steps are practically foolproof, so I can assure you that if you follow Sharon’s advice in the book–and much of it is really common sense, you should have success in presenting a webinar. Sharon’s viewpoint in this book is from a marketing perspective, in that webinars are used to drive people to a brand, increase leads, and provide resources to your customers. And for 99.9% of time, this is a main focus for most people who would read this book. But even for people who are academics, for example, who are not necessarily trying to create a brand, but rather disseminate valuable information, this book is still helpful because it put the reader in the right mind-set to create a virtual presentation that is meaningful for his or her audience. For example, while I am promoting my “brand” of TechCommGeekMom, I’m not really selling a product or service the same way that a software company or communications service consultancy would be. (At least I’m not at that stage yet!) Even so, I know that when I present the webinars that I’ve done, there is some sort of value based on the type of information that I’m providing. By referring back to 8 Steps to Amazing Webinars as I prepared for this upcoming webinar, I knew that I was on the right track to maximize the information that I will be delivering. It also made me reflect, based on these steps, what made for a bad webinar, and I’m sad to say that I’ve attended a few of those in my time. I think I even remember one that Sharon and I attended at the same time, and I remember us talking about how disappointed we were with that one webinar, and we had the same sticking points about it. I highly endorse this book for its strong content and its easy-to-read, straightforward language. Anyone who is doing a webinar–or even an in-person presentation–can gain some great pointers and advice following Sharon’s advice. Hey, it’s such good advice that the book is endorsed by the STC itself, and I know that many of their best webinars follow Sharon’s methods. So that says something right there! You can find the book on Amazon.com, Barnes & Noble, and XML Press websites. And be sure to follow Sharon on Twitter too– she’s @sharonburton, or on her blog found at sharonburton.com. She always has good information to pass along that goes beyond just how to do webinars! This entry was posted in Uncategorized and tagged 8 steps to amazing webinars, Adobe, Adobe Day, Adobe FrameMaker, Adobe RoboHelp, Adobe TCS, Adobe Technical Comm, Adobe Technical Communications Suite, amazing webinars, awesome webinars, Barnes & Noble, Business, client services, content strategy, customer service, digital literacy, DIY education, E-book, education, Framemaker, good webinar, Information, Learning, Marketing, marketing webinars, Maxwell Hoffmann, Online Teaching and Learning, Sales, services, Sharon, Sharon Burton, SIG, social media, STC, steps to a webinar, tech comm, tech comm software, TechCommGeekMom, Technical communication, technical communications, technical writing, Twitter, Web conferencing, webinar advice, webinars. Bookmark the permalink.